NOW: $12.50 – 50% off! 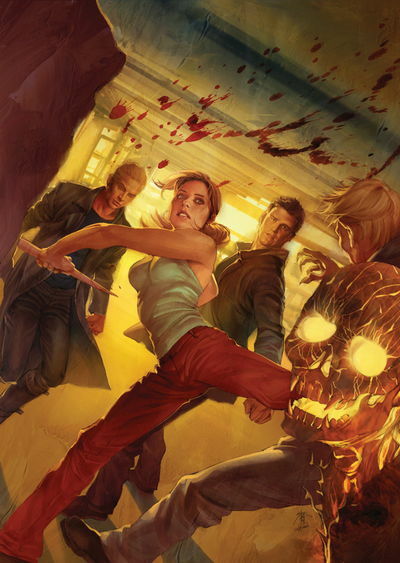 Series creator Joss Whedon unites with writers from the Buffy television series and comics creators to tell tales of the Slayers and vampires through time. This anthology delves deep into the histories of the young women destined to fight against the vampires and demons, and explores tales of dungeon-dwelling vampires as well as those in the modern ageincluding a few dealing with the latest in vampire trends: living in the public eye. Collects Tales of the Slayers TP; Tales of the Slayers: Broken Bottle of Djinn one-shot; Tales of the Vampires #1-#5; "Dames" from Drawing on Your Nightmares Halloween Special; Season Eight Tales of the Vampires: The Thrill one-shot; Season Eight Tales of the Vampires "Carpe Noctem" from MDHP #31 & #32. Legal Notice: Entire contents trademarked (® or TM) and copyrighted (©) 1986-2019 by Things From Another World, Inc. and respective copyright and trademark holders. All rights reserved. Page rendered at 2019-04-25 21:02:04 in 0.180 seconds.